Sitting high on my bar stool I looked around the humble taproom. Distressed brick walls were decorated with hip metallic signs, chrome tables lined the floor and a vintage bicycle hung from the ceiling. 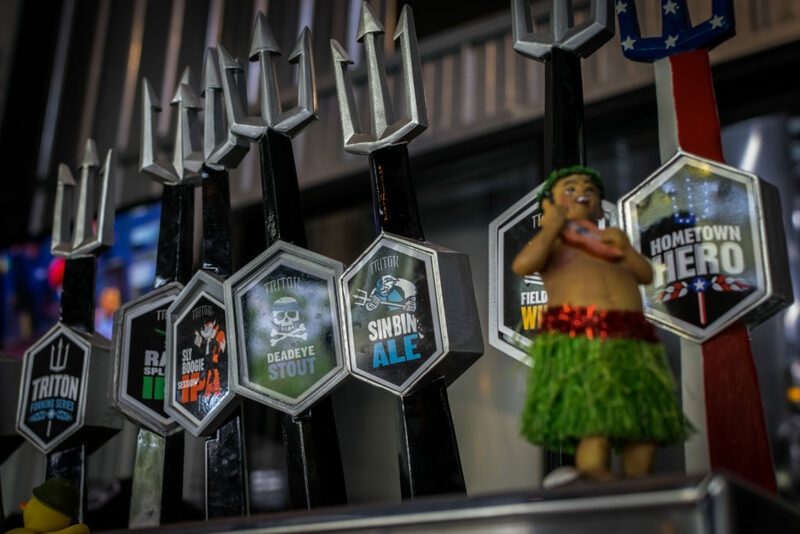 Glass growlers lined far shelves, and a little plastic hula girl rocked her hips on top of the row of taps every time one of the bar tenders pulled a lever. Out of context I could see myself sitting in a brewery in Brooklyn rather than in the heart of historic Fort Benjamin Harrison just outside downtown Indianapolis. 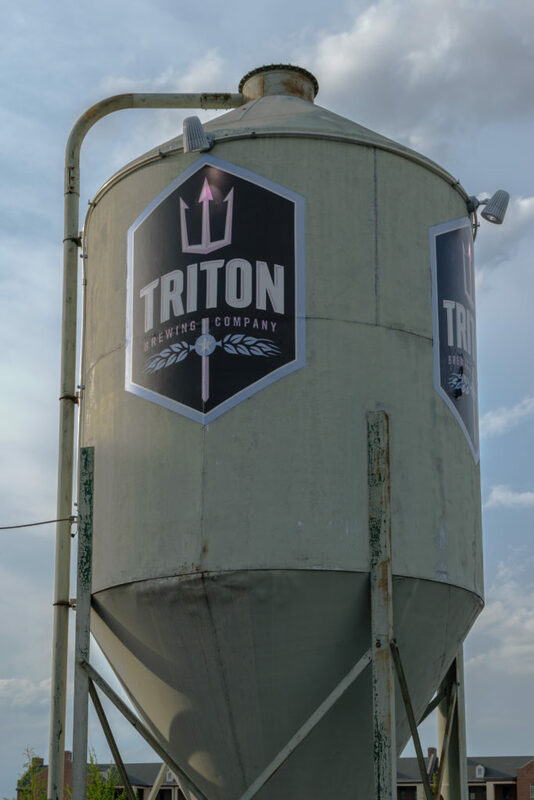 I sat sipping beer as David, Triton Brewing Company’s co-founder and self proclaimed Director of Awesomeness regaled me with the brewery’s rich history. It was hard for me to envision the trendy taproom occupied by mustachioed cavalrymen in the period between the two World Wars. Named after President Benjamin Harrison, an Indy native, the military fort and subsequent neighborhood carried the weight of a colorful history. Triton’s brewery was no exception. “Most recently it was a warehouse for race cars.” David added with a smile. “No kidding?” I asked, looking again around the taproom trying to imagine this new stage in its saga. I saw David’s eyes light up. I could tell this was a question he was asked often and enjoyed answering. I eyed each row of taps, the levers shaped like tridents, the three pronged staff favored by the Greek gods of the sea. In Greek mythology Triton was the son of Poseidon, together they oversaw the Earth’s water supply and the ways it would affect mortals. The conversation soon turned to beer. 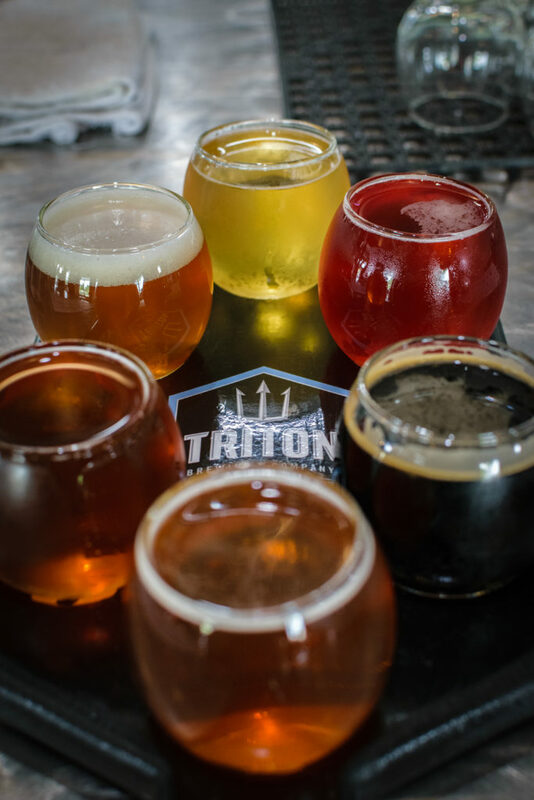 Triton had a variety of experimental sours on tap. I was excited to start digging into the small army of tasters in front of me. “That one is my favorite.” David said, as he watched reach for a glass of Barn Phantom Gose with Blueberries. Brewed with fresh blueberries and citrus, this wheat beer was slightly tart, light and refreshing. Railsplitter IPA, Triton’s flagship beer is a golden hued India Pale Ale with plenty of balance between citrus and floral notes. 2-Row, Carahell, Crystal 45 and oats give it a nice malty character with a dry finish. Feeling bold I picked up a glass of HatchPorter Pepper Ale. An American style Porter brewed with organic chocolate and cocoa nibs it kicked things up with the fiery addition of habanero peppers. The result was sweet flavor with a spicy hot finish. Last up I was excited for a taste of the Barn Owl Strawberry Tart. A kettle sour ale the brew was deeply infused with strawberries and Pink Himalayan Salt. Layered with flavor ranging from lip puckering sour to delectably sweet it was one of my favorites on offer. What Barn Owl stood for made its taste all the sweeter. David filled me in that Triton had brewed the beer special for an event in collaboration with the Indiana Department of Natural Resources. In support of efforts to save Indiana endangered species, among them the barn owl, Triton would donate 10% of its sales from the event to the DNR. Drinking my beer and enjoying my conversation with David I was sorry when all my tasters were finally empty. With the brewery’s vibrant past and wide and diverse lineup of brews that combined creative ingredients ranging from habanero’s to blueberries and rhubarb I could have happily sat up on my cozy stool sipping the afternoon away.